Listen to this – the 2.9 pound humble human brain has an astounding 100 billion neurons, with each of them having 7000 connections to other cells, and all of it is literally inside your head. This circuitry and functionality would beat even the most sophisticated tablets and laptops available! Opting for something much more humbler (about as humble as the size of a grain of rice), some scientists at the University of Arizona, back in November 2007, built a “Robo-Moth”, which constitutes of a robot, directed not by remote control, but by the brain of a moth. Yes, the robot is linked to the visual system of moth via an implanted electrode so that when the moth sees, the robot sees, and moves. I feel sorry for the moth, which has to sit in its enclosed plastic vessel, connected physically to the robot. What a boring life. Robots with biological brains may be a better option. Eh? Yeah! Of course they exist! The professor of Cybernetics at the University of Reading, armed with 20 years of research in the field of biorobotics and artificial intelligence, has made a “rat brain robot”, whose robotic body thrives on a culture of rat brain cells. The sensors on the robot send the signals to the makeshift brain, which processes them and produce responses, similar to living systems – and it learns! So, a two hour old robot made a lot of mistakes and bumped into walls, but at three months, it had learned from its mistakes – it changed direction on detecting a wall in front of it. 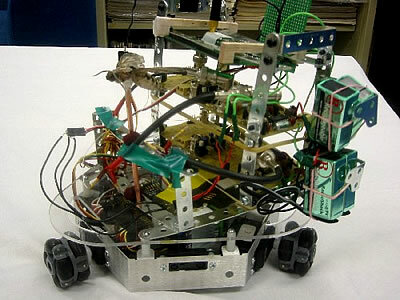 This robot runs solely on its biological brain, with no computer involved. Looks like we may soon enter the era of Hybrid machines, which will have staggering impacts on everything around us. And, so far, these are the miracles of only a couple of neurons, nothing compared to the human brain… And, of course, you must have heard, we, the so-complex human beings, only use 10% of our brain in our lifetime… And, a hardware processor of the capacity of a human brain – well, that might be scary! But if I critically see this Blog I should say……… Learning is the big thing but…. decision power is the biggest thing. Having this power means you are out of control of anybody. means you are independent. but yes it is a big achievement. They have moved one step forward.